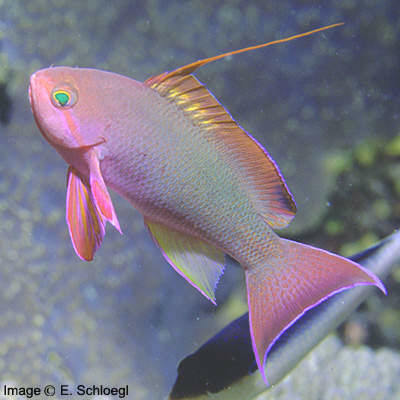 The scalefin anthias lives in a group or shoal, dominated by a few males. This pretty little fish can live in a fairly small tank (minimum of 200 liters) furnished with hiding places. It feeds on plankton in the wild and prefers small items of food, particularly live prey. This fish is sometimes classified in the Anthiid family. Size: 12 cm.